The constellation Gemini. Roll mouse over to see labels. Gemini is a northern constellation, dominated by its two brightest stars, Castor and Pollux. It is visible throughout the northern winter months, culminating at midnight around New Year. Both the galactic plane and the line of the ecliptic pass through this area of the sky: the Sun crosses the border from Taurus shortly after the June solstice, and remains in Gemini until late July. 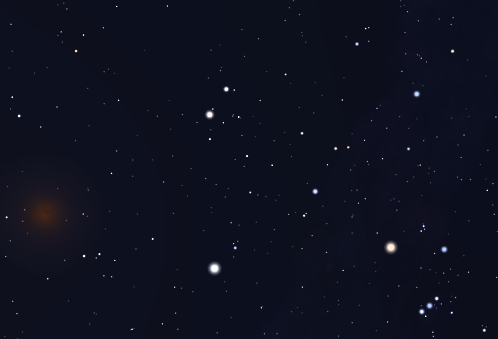 Gemini is home to a number of open clusters, the brightest of which is M35. The name ‘Gemini’ is Latin for twins, and refers to Castor and Pollux in classical mythology. Their mother was Leda, but they had different fathers. Castor was the son of Tyndareus, king of Sparta, while Pollux was the son of Zeus. According to legend, Castor was killed in a family feud with his cousins, while Pollux was an immortal demigod. After his brother's death, Zeus offered Pollux the choice of sharing his immortality with his brother, and the two were forever cast into the sky. Gemini contains the following Messier object: M35. Gemini contains the following Caldwell object: C39. 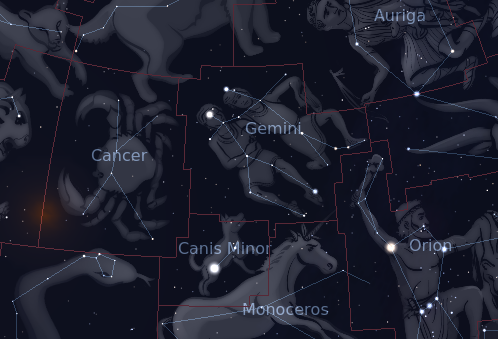 The following constellations neighbor Gemini: Auriga, Cancer, Canis Minor, Lynx, Monoceros, Orion, Taurus.